Be in the know about all your favorite sports--Here you can follow athletic news from the Hill, recent scores and local press coverage. Read the full coverage in the Glendale-News Press. We had so much fun at the annual alumnae basketball game and luncheon! Thanks to everyone who participated and made the day so great. 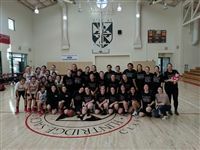 We had 28 alumnae players attend, plus their family members. Congrats to our varsity basketball team which beat Poly over the weekend at the Polytechnic Varsity Basketball Invitational to win the championship game. This was the team's 9th win in a row. Way to go ladies and congrats also to Head Coach Ty Buxman & his Assistant Coach Wes Stewart!